I’ve taken many of the Guild guitar catalogs I have and put them online so people can access them. 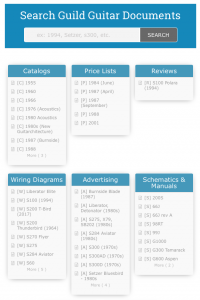 While doing that I decided to also upload all the price lists, magazine ads, articles, schematics, manuals, and other miscellaneous stuff which made it damn-near impossible to navigate. As a result of trying to manage all those documents, I present to you GAD’s Guild Knowledge Base. This page will be updated as I either acquire new items or as I scan some of the items that I’ve not yet digitized. If you have document you’d like to share let me know and I’ll add it! Some of the documents are PDFs, and some are just images. I’ve installed a PDF embedded reader so it should all just work, and I’ve made a point of everything being downloadable because information like this should not be hoarded or hidden behind pay walls.